As he glides gracefully into his seventh decade, the Geordie says he has struggled with writer's block for much of the past ten years. Perhaps that's why the ex school teacher, born Gordon Matthew Thomas Sumner, has rarely been off the road recently. Throughout 2007-2008 he reunited The Police, a band he walked out on at the height of their powers in 1984. The 14-month trek visited five continents and was seen by over 3.7million people. Last June he hit the road again - with an orchestra in tow - for his Symphonicity tour. Winding that up at the end of July this year, three months later he was back in front of a live audience. His Back To Bass Tour began in Boston a week ago. It sees the rocker playing uncharacteristically tiny venues in North America - focusing on songs from his solo career. Sitting in the stalls of the city's spectacularly elaborate Wang Theatre the day after the first show, he's in a reflective mood. "Writing a song for me is a rare thing now," he admits. "It gets more difficult as you get older because your filters are much more refined and your inner critic is very tough. "When you're younger, the filters aren't on. Out it comes. Three songs a day, 21 a week. "You have to put yourself in a state of grace where you're open to ideas coming to you. "It's very satisfying when you find one but facing a blank page doesn't get any easier." It's lucky he has such a broad back catalogue to call on. Twenty-four hours earlier and the 3,500 devoted fans crammed into the East Coast concert hall are in a state of rapture. The heavy weaponry of the super-hits remains silenced. Instead Sting and his four-piece band devote two and half hours to exploring his solo works. The 21-song set showcases a broad musicality that many people may be unaware of, from the avant-garde jazz of 7 Days to the tender country rock of I'm So Happy I Can't Stop Crying. "Country music, classical, rock 'n' roll, it's all music," he reasons, a half-finished FT crossword resting on his lap. "The past couple of tours I've done wall-to-wall hits with my orchestra and with my other band and that's kind of easy. "And," he concedes, "that's what people want to hear so to do a show that doesn't have many hits in it and still pull it off is. . . interesting". He says: "I like to please audiences. I'm not one of those people who want to say this is what I'm into now, so f*** you. "But at the same time you sometimes have to challenge people with what you do. "The audience still knew all the songs last night and I was gratified because it was a risk. "I never underestimate an audience. They're smart." His restlessness as an artist is clear - the itch to keep on moving can't be scratched. He says: "The essence of music is surprise. Every eight bars there should be something that wakes people up. Every time you put a record out you need to shock people. After a symphony tour of 150 shows and 50-piece orchestra to come out with a little rock band is throwing the cards up in the air, seeing where they land." The idea of ever retreating from the live arena is dismissed. "I love being on stage," he says "and I'll probably do it until the day I fall off it." Despite the 100million album sales, 16 Grammy Awards and global adulation, Sting refuses to take anything for granted. He says: "You shouldn't be complacent. You need that sense that you could be destroyed at any time when you're on stage." More than four decades since he strapped on his long-neck four-string bass guitar for the first time, he's still unable to understand his popularity. He says: "Twenty minutes before every show I seriously ask myself the same questions, 'Why am I doing this? What am I supposed to give to these people by the end of the night? Why do these people still care?" The answer to his final poser may be that - despite the fame, fortune and accolades - Sting hasn't become remote. His fans can still see in the 60-year-old on stage and hear on record traces of a man who lived a life before fame came calling. A man who clings on to a chummy down-to-earthiness that many of rock's most iconic performers have lost pretty quickly. "I was 27 before anything ever happened for me," he recalls. "I had a job. I paid my rates. I had a kid. I had to find the money at the end of the month for the mortgage. "I'm not singing about anything that's particularly alien to any member of the audience. Relationships break up, people die, you mature. Things occur to you. I'm singing the song of my life. I've suffered and I've had joy, so I have to reflect that." He adds: "I'm still a working guy. I don't live a rarefied life. "I like my castle," he adds mischievously, "but I won't let myself be defined by it." The current tour, which will take Sting up until the middle of December, is ostensibly to publicise his greatest hits collection. Sting: The Best Of 25 Years covers the same fertile solo ground as the shows. He says: "I never watch old footage of myself. I think I have a sense of who I am and I get embarrassed about the past. "But I had to confront it for this record and I was pleasantly surprised by a lot of the musical decisions I made as a younger man that still hold water." Turning 60 earlier this year also led Sting to take stock. "In real terms now there's more of your past than there is of your future," he says. But that isn't something he will dwell on. He says: "It's maudlin to think of it that way. Every experience you have from now on is more intense. "Every summer that you have. Every meal that you eat. Every time you make love it's more intense because it's limited. "The acceptance of that can enrich your life. I'm not ready to die yet. I'm not ready to retire." While he's scaled the heights during his career, success has proved elusive for his daughter. Eliot, 21, released her debut album under her stage name I Blame Coco last year. It scraped to 86 in the UK charts and in a sense her father is relieved at its relative failure. "I don't envy Coco. She was really disappointed. But, it's good to have setbacks. To be successful so young I don't think is ultimately good. "You need to build a backbone and resilience and get in that van, dust yourself down and carry on. I wasn't famous at a young age and I'm glad of that." Ultimately though there's a sense of serenity that oozes from one of rock's elder statesmen. He says: "I'm not hankering after eternal youth. I'm a 60-year-old father of six. "I want my music and the way I present myself to be true. I feel at home and comfortable with the way I look and behave and in what I create. "So I'm sort of happy, and I hope that's reflected." "I love being on stage," he says "and I'll probably do it until the day I fall off it." Well, stay far away from the edge of the stage and do not fall off it. I would love to hear this "Back to bass" concert in Paris next year. For a The Sun interview and the fact that Sting doesnt read The Sun, this article is pretty good! Still no mention of uk dates. We are pleased to announce the winners of the Sting.com 25 Days Countdown! The grand prize winner, George Rapitis, will receive a unique, one of a kind Sting Signature Series Precision Fender Bass customized with artwork inspired by the Sting: 25 Years box set, plus an autographed copy of the box set, a Sting.com fan club one-year membership and a Back to Bass tour merchandise pack. 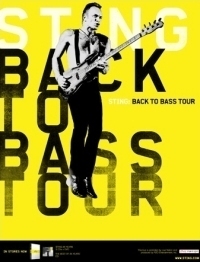 The three runners up, Jen Ashlin, Sheila Barnes and Denise Holder will each receive a signed copy of the Sting: 25 Years box set, a Sting.com fan club one-year membership and a Back to Bass tour merchandise pack. Congratulations to all of our winners and thank you again to everyone who participated in the 25 Days Countdown!